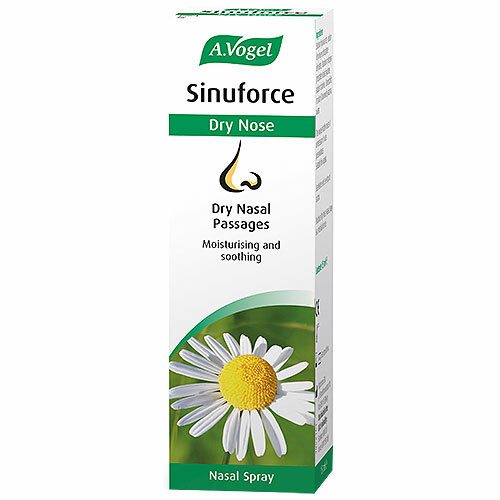 A Vogel Sinuforce Dry Nose Nasal Spray contains moisturising and soothing ingredients to help dry nasal passages and mucus crusts. It forms a protective layer over the affected nasal tissues and binds moisture, helping to prevent dehydration. Sodium hyaluronate, sodium dihydrogen phosphate dehydrate, disodium hydrogen phosphate dodecahydrate, sodium chloride, Chamomilla recutita (Chamomile) aroma, water. Spray once or twice into each nostril, as often as required. Shake bottle and remove the cap before use. Hold the bottle upright while spraying. Do not exceed the stated dose. Can be used as directed by a healthcare professional during pregnancy or breast-feeding. Below are reviews of A Vogel Sinuforce Dry Nose Nasal Spray - 15ml by bodykind customers. If you have tried this product we'd love to hear what you think so please leave a review.